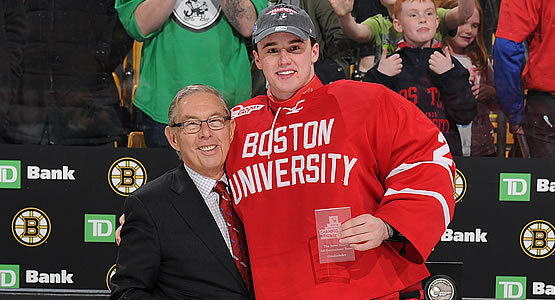 After winning its ninth Hockey East Championship on Saturday, BU swept the conference’s weekly awards. Tournament MVP Jake Oettinger took down both Player of the Week and Defensive Player of the Week honors, while freshman Shane Bowers (four assists) claimed the Rookie of the Week Award. The sophomore goalie posted a 1.84 GAA and .945 SV% in the tournament. Junior Jordan Greenway, with six points (2G, 4A) in the tournament and Chad Krys (G, 3A), who joined Oettinger on the All-Tournament Team, also were named to the Weekly Top Performers list. BU moved up five spots in the USCHO Weekly Poll to #13. The Terriers’ opponent in the NCAA Regionals, Cornell, fell from #2 to #4 after dropping its ECAC semifinal to Princeton. The rest of the Northeast Regional draw is #8 Northeastern and #10 Michigan. BU also is #13 on the USA Today/USA Hockey Magazine Poll. With @TerrierHockey making its fourth straight NCAA appearance, the only schools with longer active streaks are Providence (5) and Denver (11). BU's 36 all-time NCAA appearances trail only Michigan & Minnesota (both at 37). BU made five consecutive NCAA appearances in the 1970s (’74-’78) and nine consecutive appearances in the 1990s (’90-’98). ►For the first time in 40 seasons, Minnesota, North Dakota and BC all failed to earn a spot in the NCAA tournament. That streak began in 1978 when BU beat BC in the national championship game. 2018 recruit Jake Wise was named USHL Forward of the Week. The 5’11” center from Reading, Massachusetts scored six points in a pair of NTDP U18 wins over Madison, including a natural hat trick in Friday’s 6-4 victory. 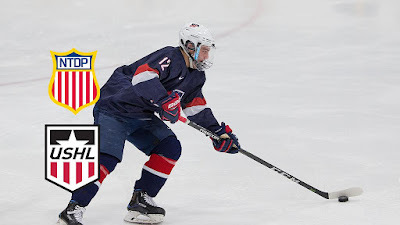 Wise has 24 points (7G, 17A) in 15 USHL games and 32 points (7G, 25A) in 27 USDP games. In HockeyProspect.com’s latest ranking for the QMJHL draft, 2020 BU recruit Josh Lawrence occupies the #1 ranking. The right-shot center from Fredricton, New Brunswick scored 83 points in his second season with Selects Academy. The USHL Omaha Lancers issued a press release on the 2019 commitment to BU of their goalie, Vinnie Purpura. Lancers Head Coach David Wilkie said. Clayton Keller, who scored his 20th goal on Saturday and has eclipsed 50 points, talks about getting his “second wind” in his rookie season.